food, travel, family and fun—join us as we go on a weird and wild ride through life. I think we watch too many cake baking challenges on the Food Network. Does anyone else out there have young children who would chose a food challenge over iCarly? What about young kids who draw pictures of their cake creation ideas? 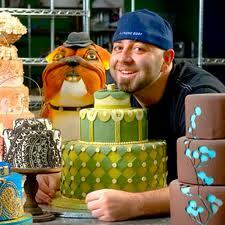 Any kids who desperately want to be on one of the Food Network shows so that they can chose the winning cake? If you don’t watch these shows, you may not understand what I am talking about. Basically, there are four cake designers and they are given the job of creating the cake that the client likes the best. Sometimes the client is a young child planning their own birthday party, sometimes it is the director of a large corporation (Norwegian Cruise Lines). 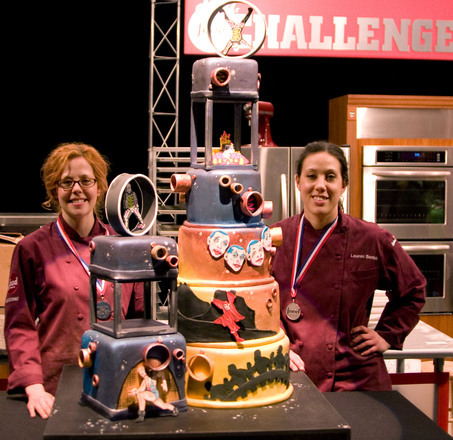 Of course their cakes are over the top and nothing anyone would ever want to eat—but they are fun to watch them create. 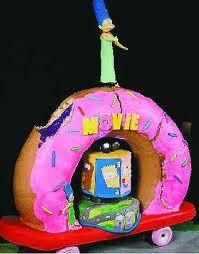 Basically sculptures created with cake. We always have a friendly little bet going to make the show more exciting–whoever guesses the winning cake wins a dollar! Last night, I won and the kids burst into tears. A few nights ago, they both selected the winning cake and danced around the house like they had made a winning touchdown. I wish I had a video of that. So, Aaron’s birthday is today was last week and the kids drew pictures of the cakes they intended to make for him. 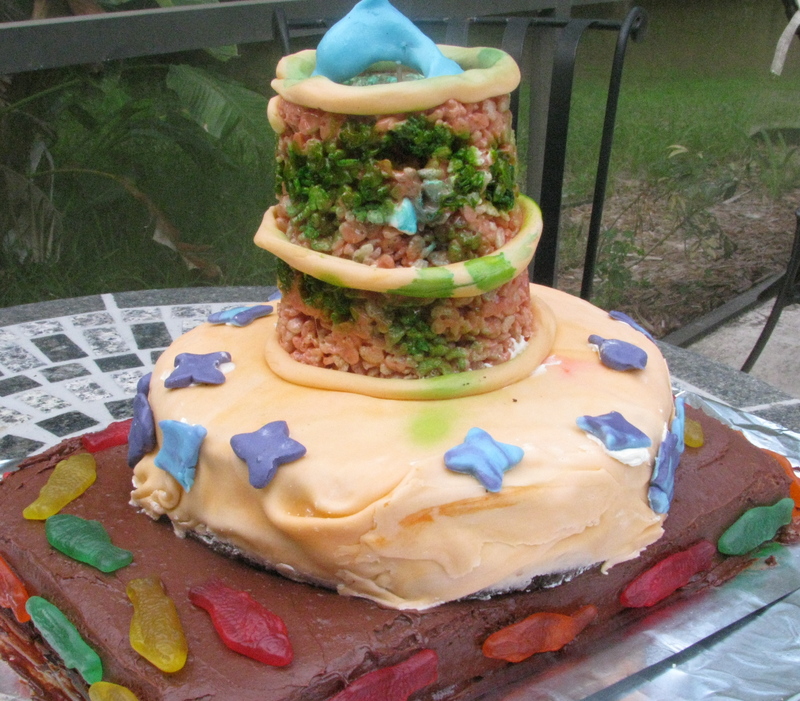 The Bean’s cake drawing consists of a layer of smoke, rockets that shoot out fossilized shark teeth, and a rice crispy treat layer topped with fondant dolphins. Oh, and all layers need to have some type of long, candle—constantly spewing out fire and sparks. In my 7 year old’s mind, this is the perfect cake for his dad. And one that he really, really wants made and believes we can do. Rosie’s cake was a bit more simple–only three layers (instead of 4), no smoke or fire (except for candles) and a fondant figurine of Mommy standing on the top holding, of course, a fossilized shark tooth. I had planned a peanut butter cheesecake–but that will have to wait. So, yesterday last Thursday, I was home (due to the Bean’s ant collection getting out of its jar and into my bed, resulting in a hugely swollen disgusting looking eye, but we don’t need to talk about that right now) —and started to think about this cake thing. We bought some fondant, whipped up some buttercream and rice crispy treats and started to piece it together. In the end, it didn’t come out at all like either of their drawings and I think it looks terrible. The kids, however, COULD NOT WAIT to show Aaron and are so proud of their creation. The Bean wanted me to send photos of it to his teacher and Rosie wants to take fondant to school so she can play with it at her desk. Both of them made me promise to post it on my blog. It was like they had just won $10,000 in the Food Network Challenge. Bottom tier: Rectangluar yellow cake with a bittersweet chocolate buttercream, covered in minature fish figurines. Middle Tier: Dark chocolate cake with a white buttercream (a really good one at that!) covered in orange fondant with purple and blue random fondant shapes. 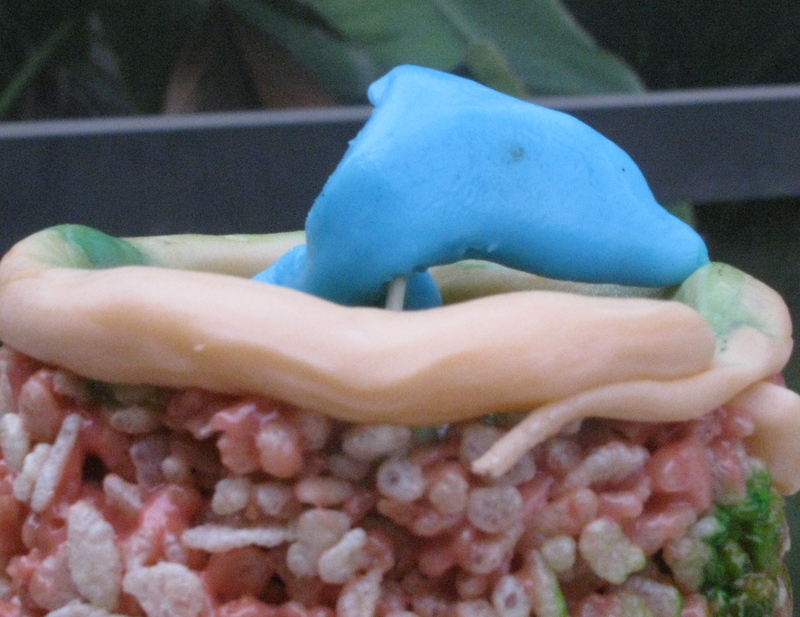 Third tier: Peanut butter rice crispy treats molded into a tall shape and sprayed with green food spray—lined with fondant stripes and topped with a fondant dolphin. What did Aaron think? He loved it of course!